My favorite time of the year is finally here. From Thanksgiving on out it's all about friends, family, and of course food. I love to cook, love to try new recipes and if I'm feeling brave I might even try flying solo in the kitchen. Most of my own concoctions wind up being disastrous but at least I try. Right about now North Carolina is starting to get pretty chilly which is perfect for covering up the extra poundage. How can someone NOT put on LBs during this time of year? There are just so many reasons to eat: Thanksgiving, Christmas Eve, Christmas Day, New Year's Eve, Christmas parties, sweet treat, wine and appetizer exchanges, etc. I've had quite a few people ask about my recipes so here they are. All of them have been tried and stamped with my approval. Or as in the case of the damn cake balls, stamped with contempt. COMBINE APPLE CIDER, JELLY AND BUTTER in a small saucepan. Cook and stir until butter is melted. Remove from the heat and set aside. Reserve 2 Tbsp. for finishing. 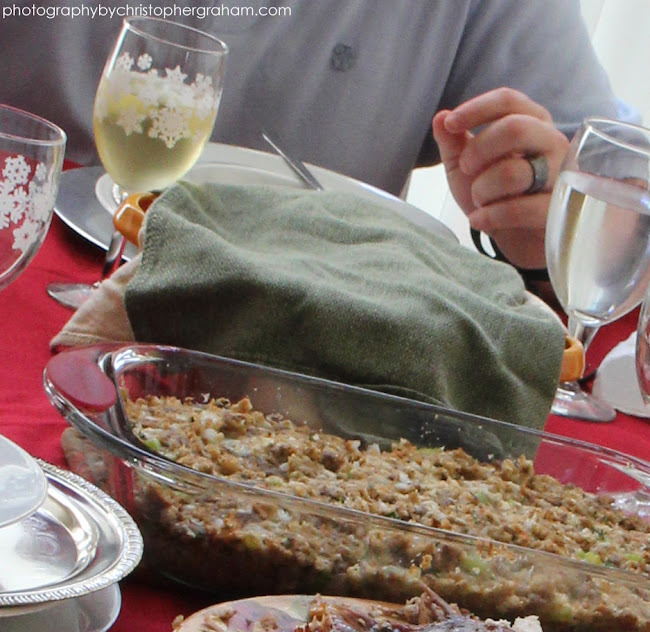 COMBINE MINCED SAGE AND BUTTER in a small bowl. 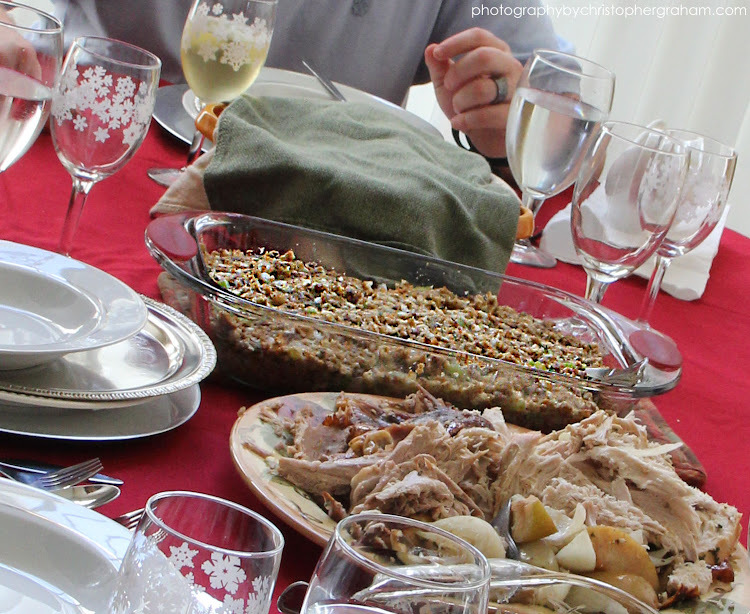 With fingers, carefully loosen skin from the turkey breast; rub butter mixture under the skin. 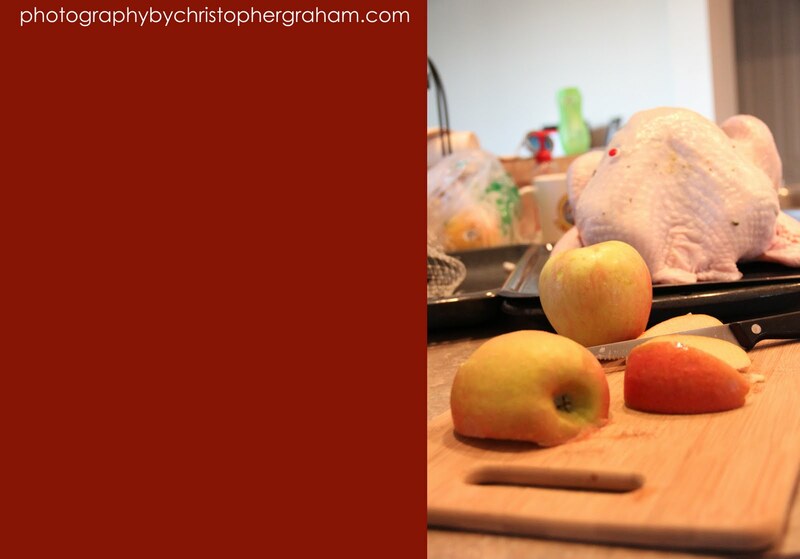 Brush turkey with apple cider. Sprinkle salt and pepper over turkey and inside cavity(remove icky goody bag from the cavity first). PLACE APPLES, ONION, AND SAGE LEAVES inside the cavity. Tuck wings under turkey; tie drumsticks together. 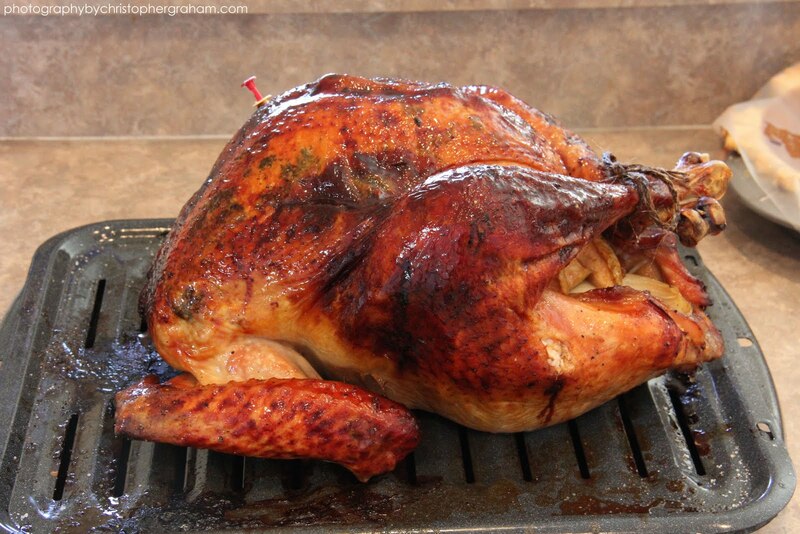 Place breast side up on a rack in a roasting pan. BAKE UNCOVERED AT 325 for 3 1/2 to 4 hours or until a meat thermometer reads 180, basting occasionally with cider mixture. Cover and let stand for 20 minutes before slicing. To prepare potatoes, place potatoes in a Dutch oven; cover with water. Bring to a boil. Reduce heat, and simmer 20 minutes or until tender; drain. Cool 5 minutes. Place potatoes in a large bowl; add granulated sugar, evaporated milk, 3 Tbsp. melted butter, 1/2 tsp. salt, and vanilla. Beat with a mixer at medium speed until smooth. Add eggs; beat well. Pour potato mixture into a 13x9 inch baking pan coated with cooking spray. To prepare topping, weigh or lightly spoon flour into a dry measuring cup; level with a knife. Combine flour, brown sugar, and 1/8 tsp. salt; stir with a whisk. Stir in 2 Tbsp. melted butter. Sprinkle flour mixture evenly over potato mixture; arrange pecans evenly over top. Bake at 350 for 25 minutes or just until golden. 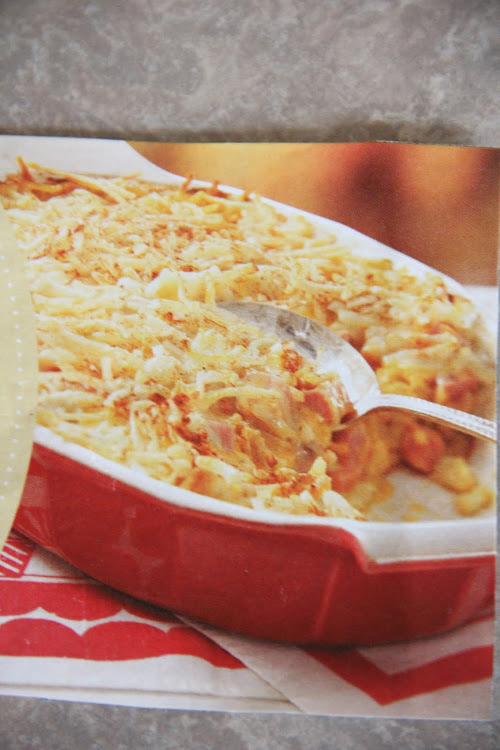 Preheat broiler (remove casserole first). Broil casserole 45 seconds or until the topping is bubbly. Let stand 10 minutes before serving. Heat oven to 350. Grease a shallow 3-qt baking dish. Melt butter in same skillet. Add onion and celery, and cook over medium heat, stirring occasionally, 10 minutes or until tender. Add broth and water, stirring to remove any browned bits. Add to bowl. Gently toss to mix. Spoon into baking dish and cover with foil. Bake 30 minutes. Uncover and bake 15 minutes more or until lightly browned. Place all ingredients in a large saucepan and bring to a boil. Reduce heat and simmer 15 minutes or until most of the cranberries have burst. Remove from heat. Cool slightly, then refrigerate covered for up to 2 weeks. Combine Bisquick with cold butter in a medium bowl using a pastry cutter or a large fork. You don't want to mix too thoroughly. There should be small chunks of butter that are the size of small peas. Add cheddar cheese, milk, and 1/4 tsp. garlic salt. Mix by hand until combined but don't over mix. Drop approx. 1/4 cup portions of the dough onto an ungreased cookie sheet using an ice cream scoop. 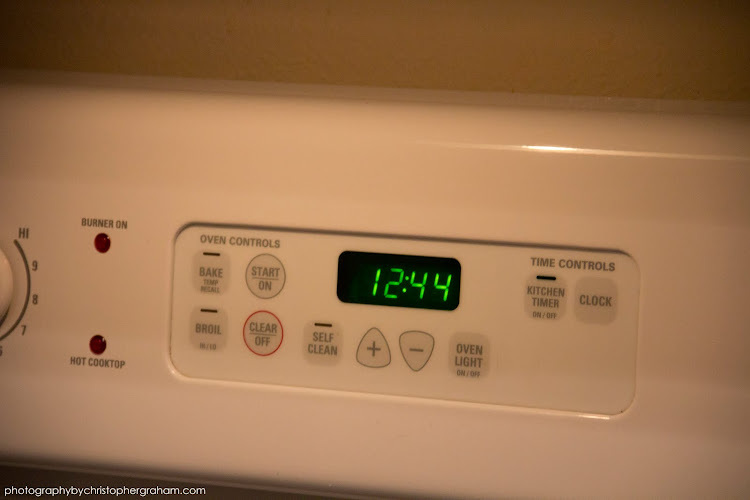 Bake for 15 to 17 minutes or until the tops of the biscuits begin to turn light brown. When you take the biscuits out of the oven, melt 2 Tbsp. butter in a small bowl in your microwave. Stir in 1/2 tsp. garlic powder and the dried parsley flakes. Use a brush to spread this garlic butter over the tops of all biscuits. Use up all of the butter. Slice each block of cheddar cheese into twenty 1/4 inch slices. Cut each block of cream cheese into 18 slices; sandwich between cheddar slices, using a knife to spread evenly. Create four 6 inch long blocks of cheese; place in 13x9 inch dish. 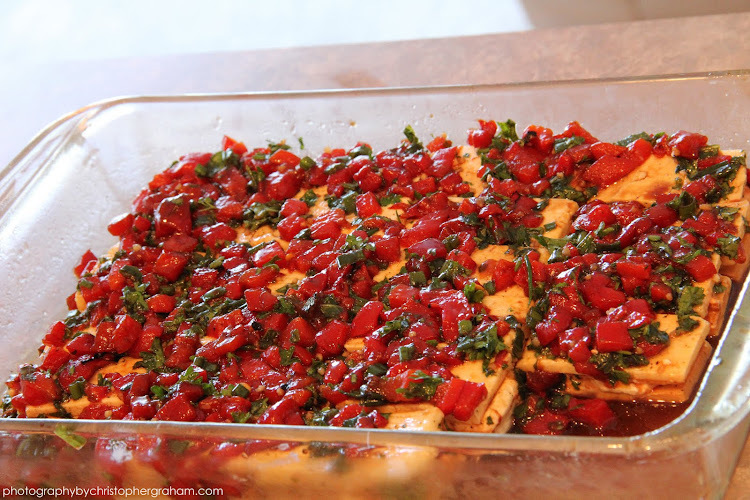 Combine the roasted peppers, oil, vinegars, onions, herbs, sugar, garlic, salt and pepper; pour over cheese. Cover and refrigerate overnight, turning once. Drain excess marinade. Serve cheese with bread or crackers. Boil the eggs for a minimum of 10 minutes. Drain hot water and soak eggs in cold water until they are cool to the touch. 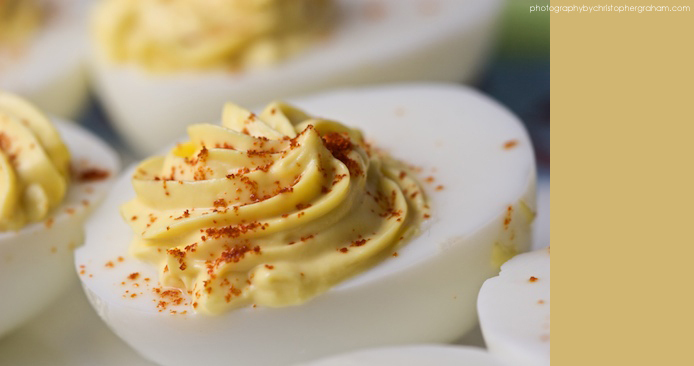 Peel eggs and slice in half long ways. Place all yolks in a small bowl and add all the ingredients above to taste. Place mixture back into hollowed eggs. Cover and refrigerate until ready to serve. If, after all that, you are still interested.....well....don't say I didn't warn you. In a large bowl combine cake mix, coca packet, 1 1/4 cups coffee, oil, and eggs; beat on low speed for 30 seconds. Beat on medium for 2 minutes. Pour batter into a greased 13x9 inch baking pan. Bake at 350 for 30-35 minutes or until a toothpick inserted near the center comes out clean. Cool. Place cherries in a food processor; cover and process until coarsely chopped. Transfer to a small bowl; stir in brandy, preserves and remaining coffee. Crumble cake into a large bowl. Add frosting and cherry mixture; beat well. Shape into 1 inch balls. In a microwave, melt candy coating and shortening; stir until smooth. 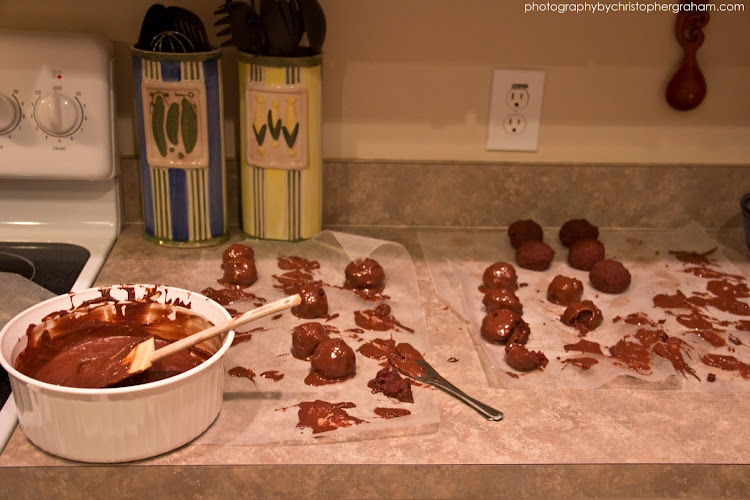 Dip balls in chocolate mixture; allow excess to drip off. Place on waxed paper; let stand until set. Store in an airtight container overnight before serving. 2. It is so hard to roll the mixture into balls. It sticks to you, itself, everything. 3. Candy coating is NOT the same as milk chocolate morsels but I think I had more success with the latter. 4. The candy coating is super thick even though you thin it with shortening. 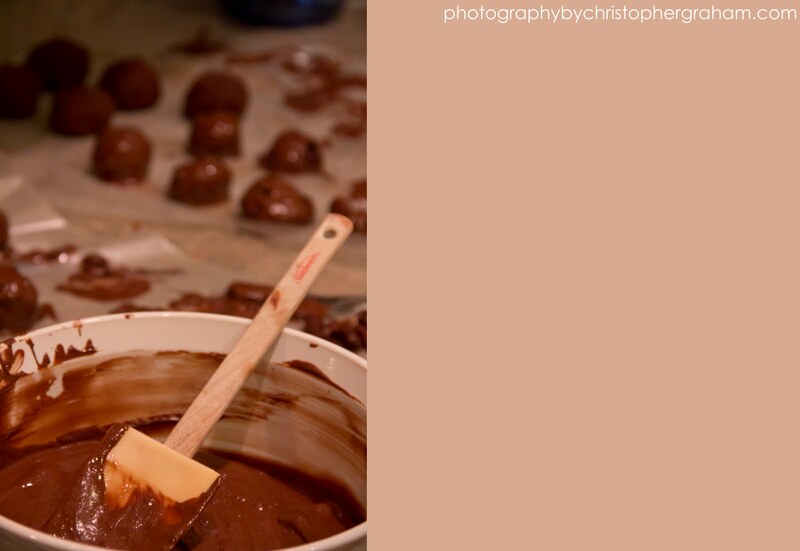 When you dip the cake balls they fall apart in the chocolate. 5. Don't think you can make the dipping process easier by placing cake balls in the fridge to harden them up. They will instantly solidify the chocolate coating when you dip them. 6. Keep in mind there is a point of no return when it comes to thinning the candy coating with shortening. You can easily end up with a watery mess. 7. Do not add water to the candy coating to thin it out. I would have known better had I read the instructions on the package before attempting this. Water will ruin all 4 lbs of chocolate. 8. I'm serious about needing 5 hours to complete this recipe. My first attempt began at 6pm and didn't end until almost one in the morning. Let's see, is there anything else? Nope, I think that covers it. 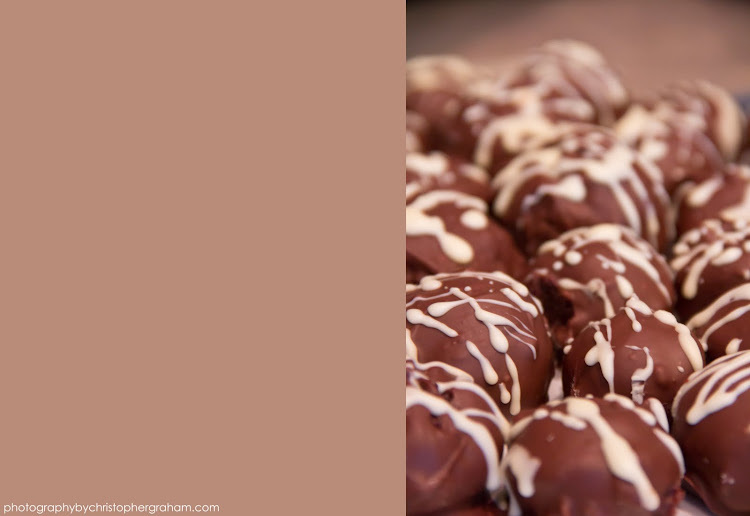 Once I cleaned up "The Great Chocolate Massacre of 2011", plated my cake balls, and drank a big glass of wine, I had to give myself a pat on the back. They were beautiful and looked like I had spent hours making them. Yes, the end part of that comment is dripping in sarcasm. There are a few upsides to this recipe. 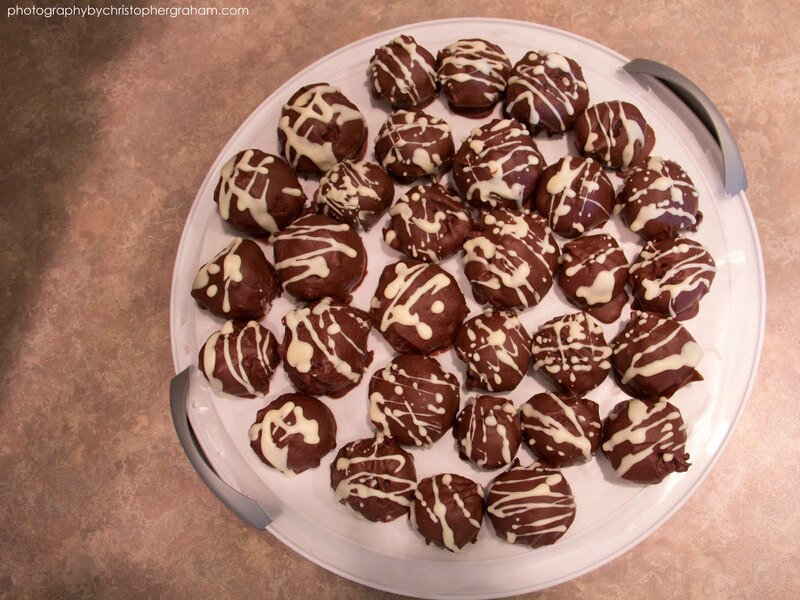 The serving size is 60 balls which is perfect for cookie exchanges. You can place 10 of them in a Christmas tin and BAM! You have 6 gifts for neighbors, co-workers, etc. Not only are the pretty but they taste pretty dog on good too. The only reason why I would attempt this recipe for a 3rd time would be because a lady accused me of buying them from the store and trying to pass them off as my own. If you only knew lady, if you only knew. Every few weeks 15 or so of us women get together for breakfast after dropping the kids off at school. 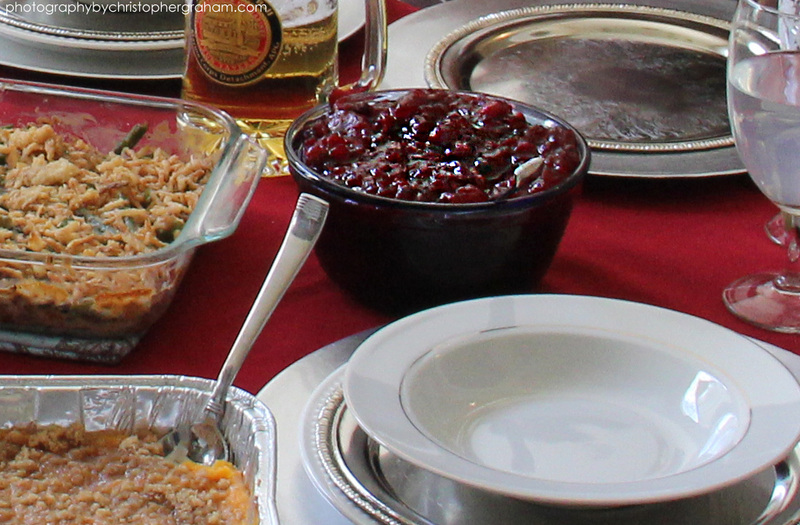 The person hosting doesn't have to worry about anything except providing coffee and drinks. Those attending take care of bringing food. The first breakfast I attended I opted to bring a casserole and a different kind of muffin. I have made the breakfast casserole the past two years for Chistmas morning. It's an excellent option because you put it together the night before. The muffins are also a good option for Christmas morning because they are super easy to prepare. 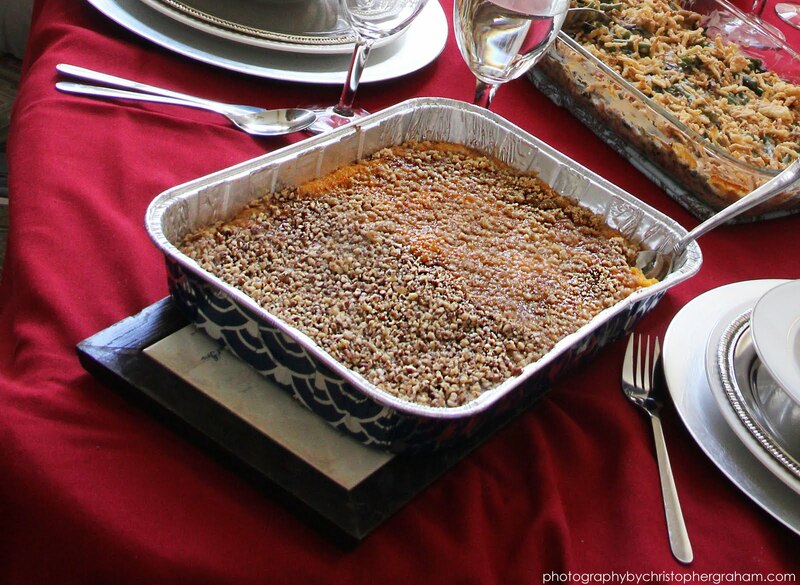 Place croutons in a greased 3-qt baking dish. Sprinkle with cheese and ham. In a large bowl, whisk the eggs, 2 1/4 cups milk and mustard; pour over ham and cheese. Cover and refrigerate overnight. Remove from the refrigerator 30 minutes before baking. Combine soup and remaining milk until blended; spread over casserole. Top with hash browns; sprinkle with paprika and pepper. Cover and bake at 350 for 30 minutes. Uncover, bake 35-40 minutes longer or until edges are browned. Let stand for 10 minutes before serving. 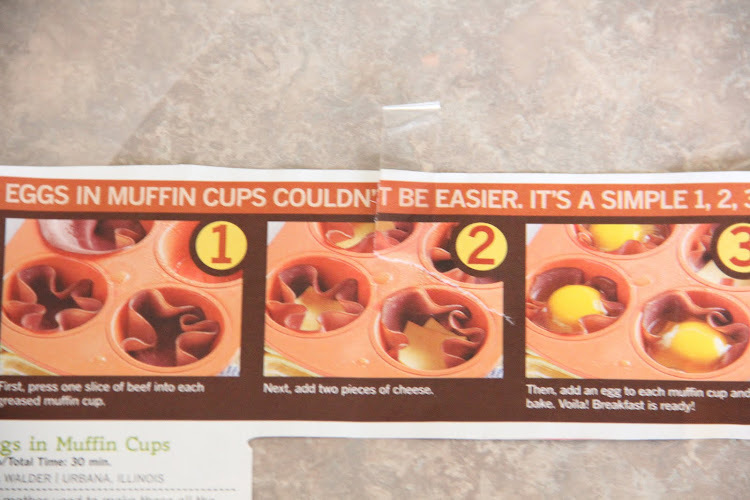 Press one slice of beef onto the bottom and up the sides of each greased muffin cup, forming a shell. Arrange two cheese pieces in each shell. Break one egg into each cup. Bake uncovered, at 350, for 20-25 minutes or until eggs are completely set. So there you are, my seasonal recipes.